In this paper mixed elements are applied to the optimal shape design of two dimensional elastic structures. The theory of shape sensitivity analysis of structures with differentiable objective functions is developed based on mixed elements, and using the Lagrangian approach and the material derivative concept. The mixed finite element model is based on an eight node mixed isoparametric quadratic element, whose degrees of freedom are two displacements and three stresses, per node. The corresponding nonlinear programming problem is solved using the method of sequential convex programming and the modified method of feasible directions, available in the commercial programme ADS (Automated Design Synthesis). 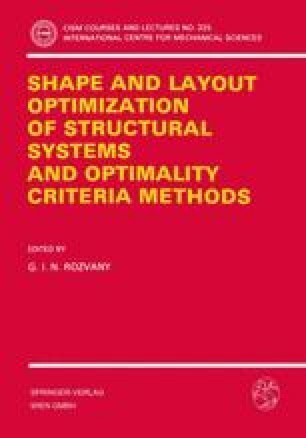 The formulation developed is applied to the optimal shape design of two dimensional elastic structures, selecting the compliance as the objective function to be minimized and the initial volume as constraint. The advantages and disadvantages of the mixed elements are discussed with reference to applications.